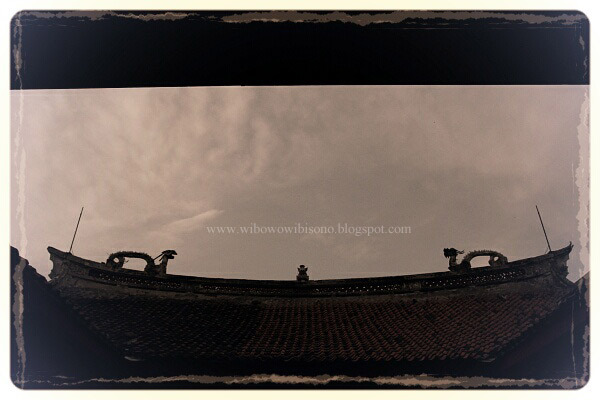 In my searching of Thio Tiong Gie, an 80 year old puppeteer whose story I had published in the previous post, I let myself lost in the Chinatown of Semarang for two days. 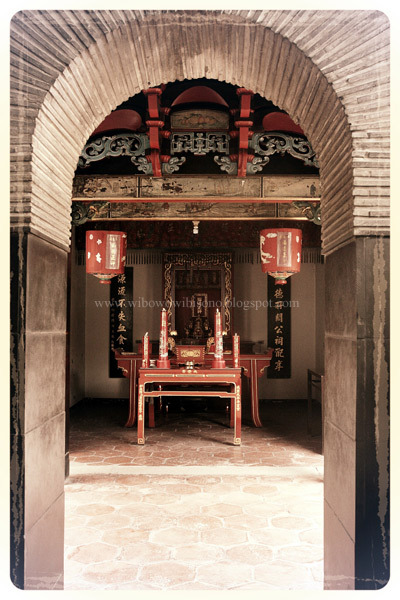 It was Chinese New Year holiday, and I thought it would be great if I could capture the festive moment at some old Chinese temples in the Chinatown. I found the puppeteer's house and had a one hour conversation with him in the late afternoon. 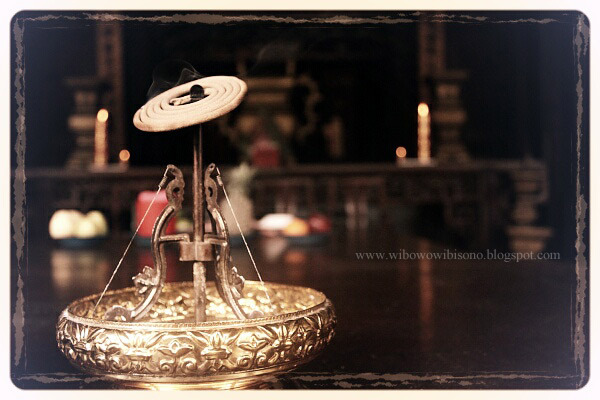 Soon after I left the house, I took a rickshaw and went straight to "Klenteng Hitam," an old temple I had visited one year before. 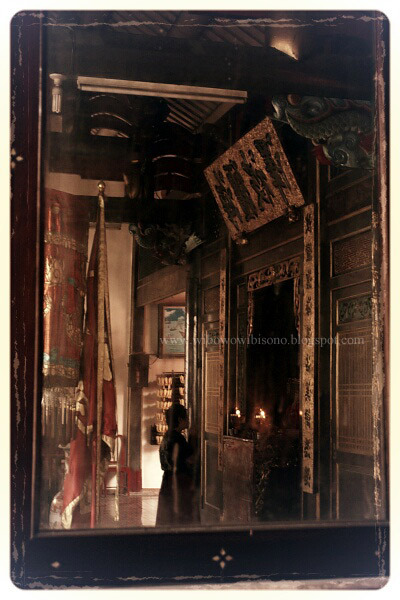 Dedicated to the family of Lim (one major Chinese clan in Indonesia), this temple had been several times taken as movie scenes. I guessed it was due to its being photogenic. Same like previous year, I only saw one or two people come to pray in the temple. It was not a perfect place to capture the spirit of the New Year. The only choice I had was to capture the spirit of the place. 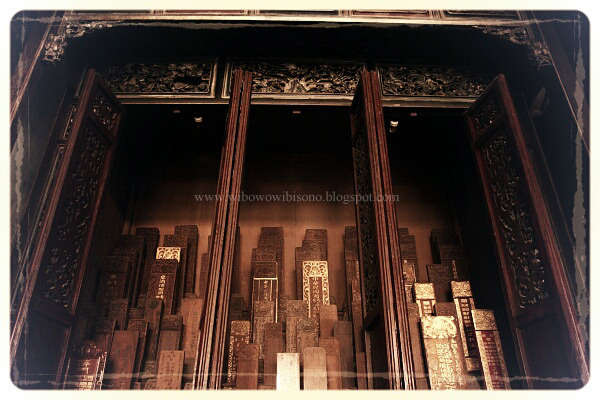 As an old temple, this building, together with all its furniture and ornaments, were well preserved. Many of them were directly brought from China. On the way back to the hotel, I stopped by at “Masjid Pekojanan,” an old mosque located on Gang Petolongan, not far from the main road of Chinatown. It was fascinated to find an old mosque within the Chinatown. 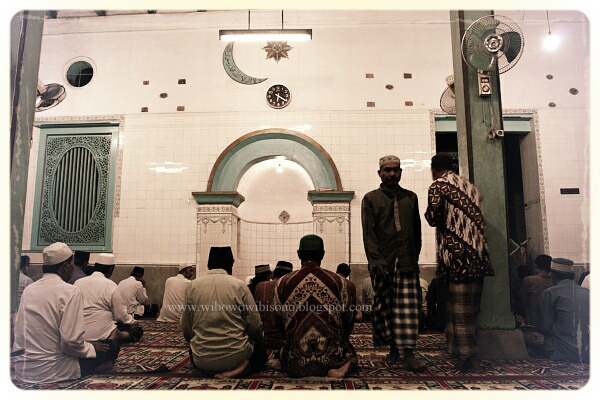 At the mosque, I saw people came for the dusk prayer. I sat on the porch, right next to a man whom I guessed was the caretaker. My guess was right. He was the caretaker who also happened to be the muezzin (a man in charge of the call to prayer). He was pleased with my coming and allowed me to take pictures of the mosque. I thought at first the mosque was founded by Chinese Muslim migrants who settled in the Chinatown. I was wrong. The founding was initiated by a Muslim community of Koja who came from somewhere in Central Asia. They looked physically like from Middle East, yet refused to be called Arabic. According to the caretaker, the community of Koja in the Chinatown had today been nearly extinct. They were naturally assimilated with native people through marriages. Only few of their traditions remained alive. One of the most popular ones was the tradition of breaking the fast, held in the fasting month of Ramadhan, where "Bubur India" - rice porridge spiced up with cinnamons, cloves, nutmeg, and ginger, served with curry - became the main course. The tradition could be traced back to two centuries ago where the community wanted to build a relationship with the locals by inviting them to break the fast. Today, the cook was no longer an Indian or someone from the community of Koja. It was a Javanese who had inherited the secret recipe of the porridge. 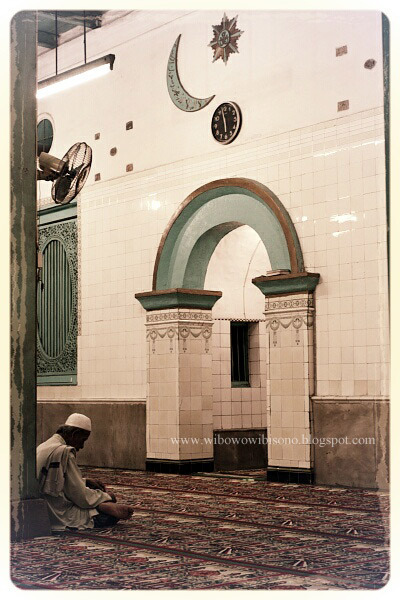 Before leaving the mosque for the hotel, I captured some pictures of the interior of the mosque. On the following morning, I returned to Chinatown for another interview with the puppeteer. This time I walked from the hotel. Since the light was good, I preferred heading to "Klenteng Hitam" first. No one was coming. So I decided to head to the puppeteer's house right away. 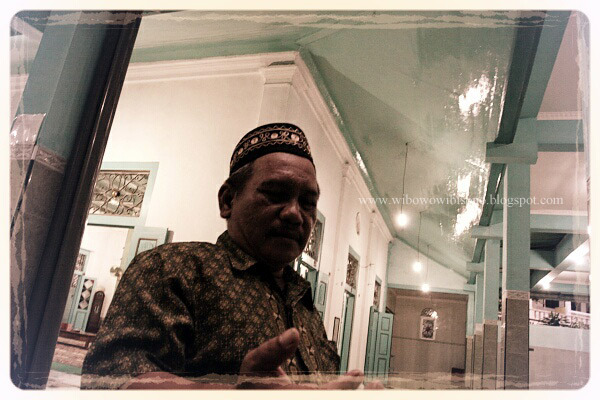 Coming back to the house of the puppeteer, I told him about the old mosque on Gang Petolongan I had come by on the previous day. He enthusiastically told me a story about where the name of Petolongan came from. I left the house of the puppeteer for the old cremation house siting on Gang Lombok, right next to the biggest Chinese temple in the Chinatown of Semarang. 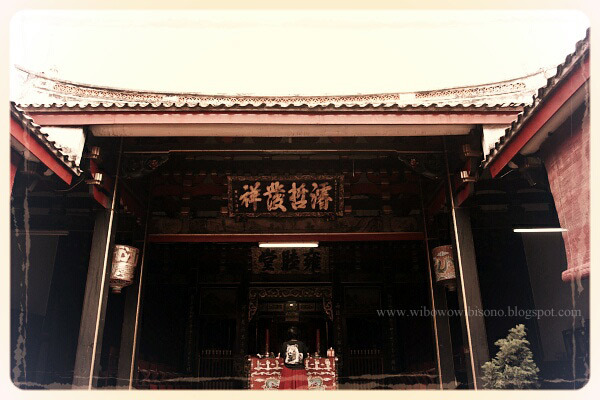 Despite the festive occasion of Chinese New Year, the cremation house was empty. No one came to pray to honor their dead ancestors. 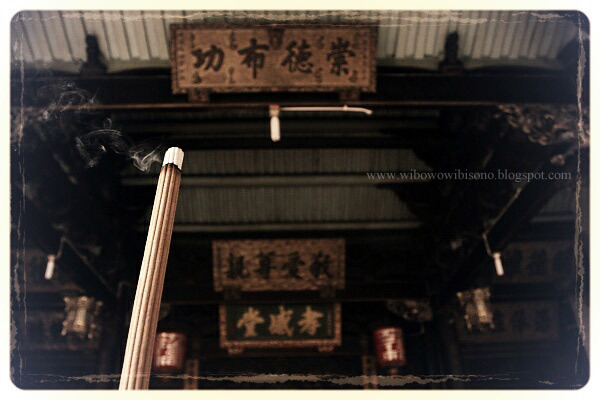 The only prayer sent to the sky was coming from the burnt joss stick at the front door of the cremation house. The caretaker - an old man who refused to give me his name - said that many of today's Chinese young generation had been converted to Christian and Catholic. He was very concerned that less and less people came to the cremation house. Perhaps I was the only one coming to that place that day. Totally, there were about hundreds of urns stored in this cremation house. 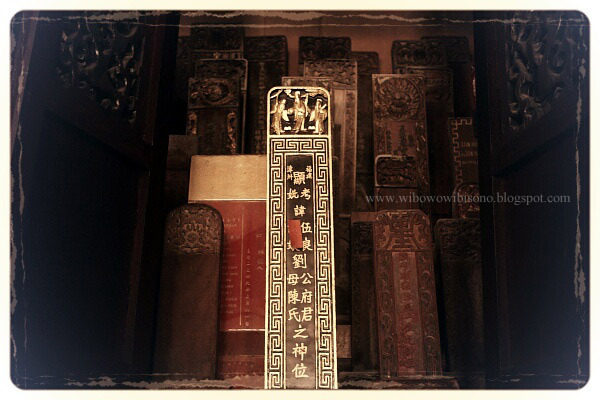 Each urn was marked and symbolized with a wooden plank written with the name of the dead. I walked along Jalan Pekojan, one main street in the Chinatown of Semarang, and then turn right to Gang Petolongan, where the old mosque of Masjid Pekojan was located, to proof what the puppeteer had told me earlier. He said that the name of Petolongan derived from the word "pertolongan" which literally means "help." The story behind that name could be traced back to many years ago. I didn't remember what year exactly it was. Long before the street was named "Gang Petolongan," it was just an unpaved narrow path, populated mostly by community of Koja. One day, a member of the community was murdered. He was brutally stabbed not far from the mosque. Due to the horrible way of dying, his spirit was said to roam and haunt everyone passing by the street at night. People were horrified with the ghost and asked local psychics to stop the terror. None of them could stop it. The spirit kept wandering on that street causing people afraid to go out at night. Depressed with the horror situation, the community of Koja decided to seek a help from a Chinese psychic from their neighbor Chinatown to end the terror. What the psychic did was as simple as engrave a spell on a plaque made of stone and put it on the wall right across the mosque. Thanks to the help, the spirit stopped haunting the street. 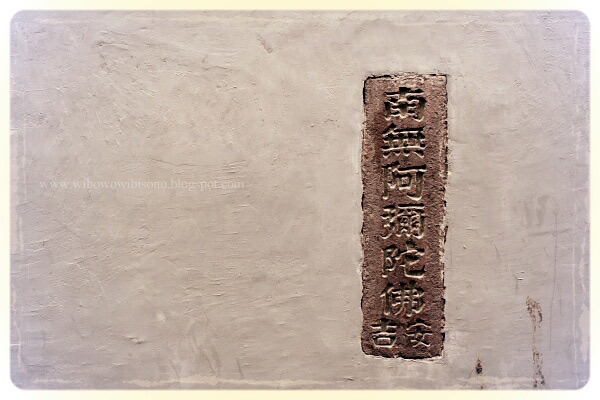 To honor the psychics for what he had done, people named the street "petolongan," aiming to strengthen the bond between Chinese and Koja community. As I got there, I found the stone plaque, right across the old mosque of Pekojan. While staring at it, I wondered what would have possibly happened if someone had taken off the plaque from the wall. Would the ghost return to haunt the street? 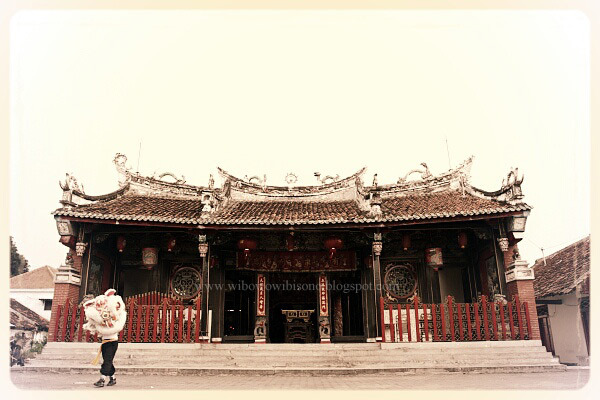 Unwilling to try, I decided to walk back to the hotel, left the Chinatown of Semarang and its stories behind. Hahaha.. ntar dicari yang layak tampil fotonya.... Malu kalo dibandingin sama blog mu.